The safety of our students, parents and staff is our top priority. Our school administrators, staff and parent volunteers, are out during drop-off and pick-up to improve traffic flow around our school and ensure the safety of everyone. Always observe all posted parking and traffic regulations. Always look to crossing guards and parent volunteers for their signal as to when it is safe for you to proceed in the traffic line. When exiting and entering vehicle, students must do so on the passenger side only. When exiting and entering vehicle, students must do so in designated areas only. Do not encourage your student to cross the street unless they are doing so in a crosswalk. Drivers may not exit their vehicle while in the drop-off/pick-up car line – even while your vehicle is stopped. Items such as backpacks and instruments will not be retrieved from the trunk as this creates a potential safety hazard. Parking in the reserved visitor spaces in front of the office for the purpose of pick-up and drop-off is strictly prohibited. 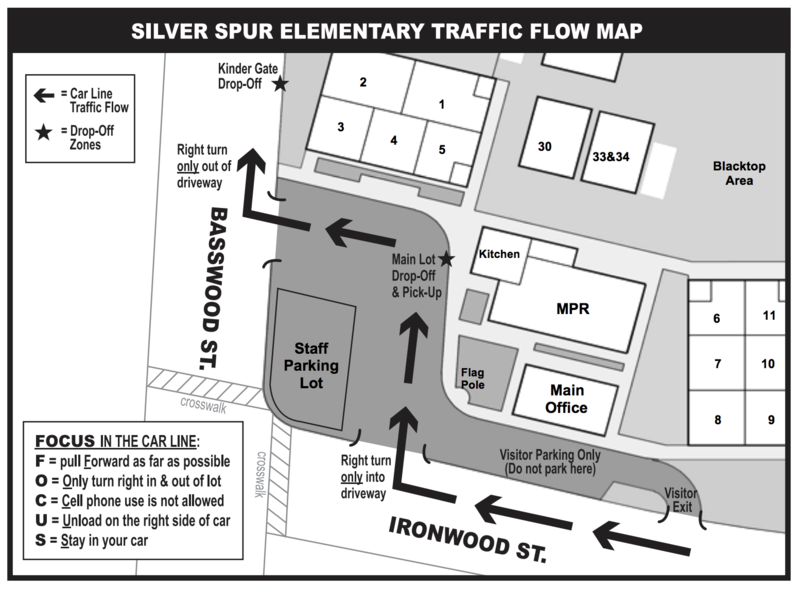 Parking in the Silver Spur parking lot is strictly prohibited as each space is assigned to a staff member - doing so may result in your vehicle being towed at your expense. Parking in red zones at any time is strictly prohibited as this space is reserved for emergency vehicles - doing so may result in your vehicle being towed at your expense. Leaving your vehicle unattended in designated drop-off and pick-up zones during hours posted is prohibited - doing so may result in your vehicle being towed at your expense. Be considerate of our neighbors and do not block driveways or garages with your vehicle while dropping off or picking up your student. If you feel that your student requires assistance beyond what our volunteer greeters are able to provide, please feel free to park your car and walk your student into the school, using the designated crosswalks. Please always set a good example for our students and be courteous to others!